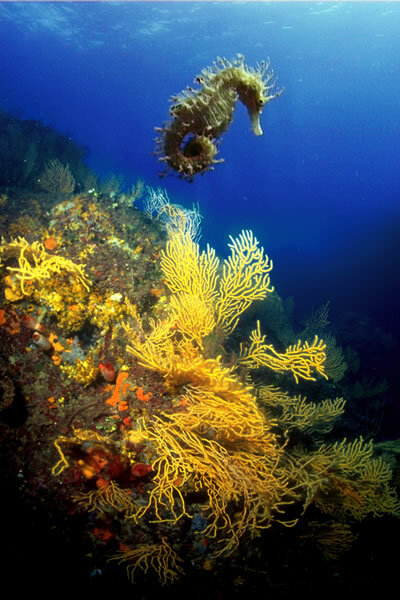 For lovers of scuba diving, the seabeds around Capo Sant’Andrea are an exciting world to be explored. Here in Sant’Andrea, marine biologists have observed that the posidonia, a marine plant with long and thin green leaves, sexually reproduces, which is a rare event in this part of the Tyrrhenian and is testimony to the cleanness of these waters. Its fruit, similar to small olives (they are actually called “sea olives”) are visible in the spring. The carpets of posidonia on the seabed are the ideal habitat for numerous species of fish living here in abundance. Shoals of small Mediterranean chromis, which are electric blue in colour, swim among the brilliant green of the posidonia, together with wrasses, needle fish, bream and porgies… there are also starfish and noble pen shells on the seabed. For more experienced divers, there are some very interesting dives near the rocks known as the “Formiche della Zanca”, to the west of Sant’Andrea. Descending down the seaward side, at depths of 40 metres and more, there are intensely coloured gorgonians to be found, and it is easy to come across lobsters, moray eels, large fishing frogs and dentex. Moon fish can also be seen during the summer, with a bit of luck. This sea also hides other treasures. Opposite Sant’Andrea, the wrecks of two cargo ships form Roman times have been found, the first is almost on the coastline, at a depth of only 10 metres, and the second 193 metres off the coast at a depth of about 45 metres. The former transported sacks of grain, the latter amphorae of wine from Campania. Many of these findings are now exhibited in the archaeological museums in Marciana and Portoferraio, but, in spite of everything, the seabed remains the custodian and natural museum of these two shipwrecks. There are innumerable plants and many unexplored corners in the sea at Capo Sant’Andrea, and enjoying these marvels is now a sport available to everyone. This is called snorkelling, or sea-watching, and is a chance for even the laziest of seaside tourists who love nothing more than a sun-bed and an umbrella to sit under, to change a normal holiday into an extraordinary experience rich in pleasant surprises; a delight for the eyes and the soul. All that is needed is a mask and a snorkel, and the desire to observe the beauty of nature. Alone or with a guide, from June to September, excursions led by expert marine biologists can be enjoyed at Capo Sant’Andrea. A light wetsuit is preferable, to protect the body from abrasions, the cold and sunburn, depending on the season. An underwater camera is a must to make this adventure truly unforgettable: one can see but not touch things down here! For more experienced divers, or those who want to learn about life on the seabeds, there is a diving centre in Sant’Andrea which hires specific equipment and organises scuba diving courses and guided immersions with PADI and SSI instructors.